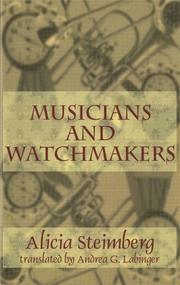 Musicians And Waitchmakers ($13.95 paperback original; Aug.; 128 pp. ; 0-935480-96-X): This episodic autobiographical novel, first published in 1971, describes in deliciously wry comic accents the experiences of an Argentinian Jewish girl (named “Alicia Steimberg”) growing up in Buenos Aires in the 1940s. The formative experiences of dawning sexual awareness, discovery of parental imperfection (in the frightening harangues of Alicia’s unstable widowed mother), and wavering devotion to contentious relatives are drolly captured in brief vignettes dominated by such vigorous characters as the narrator’s unregenerate socialist grandfather and especially her “naturalistic-vitaministic-anticonstipationist” grandmother, a fractious force of nature who might have been invented by Jorge Amado in collaboration with Sholom Aleichem. A delightful book.